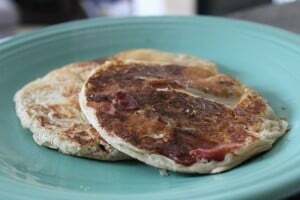 A few weeks ago, I received an email from a local company asking if I would try their new protein pancakes. 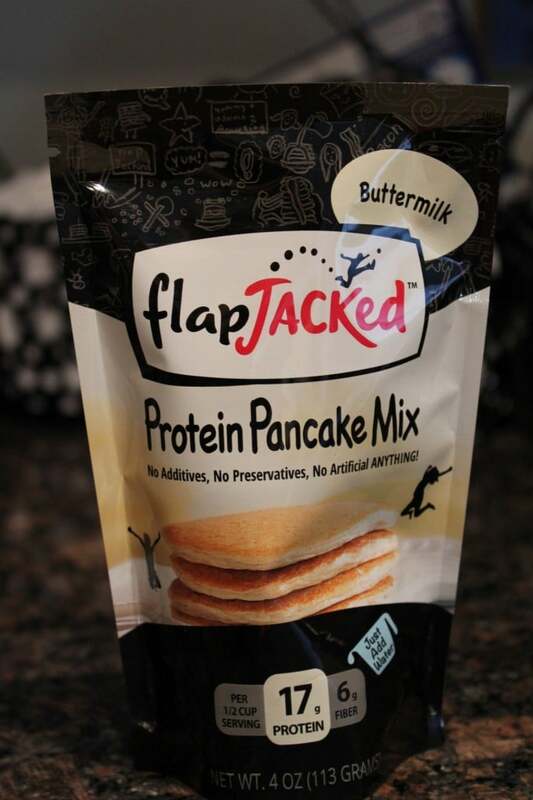 A big fan of any kind of pancakes, I agreed to try out the Flapjacked Protein Pancake Mix and was super excited when the package arrived. The idea of protein pancakes had me a little nervous to begin with. Protein pancakes I’ve heard have a strange texture, and the addition of all of the protein often times lends to additional calories that I’m not interested in eating. They sounded great! Jennifer was kind enough to send me two flavors to sample, the original buttermilk flavor and the banana hazelnut variety. 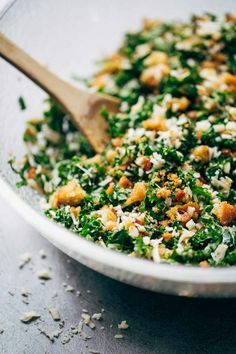 I’ve tried the buttermilk version so far, and plan to try banana hazelnut this weekend! 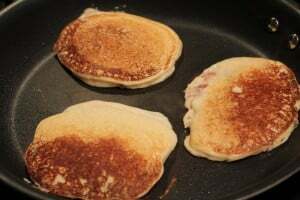 The buttermilk Flapjacked pancakes were really good, and really easy to make! The 4 oz sample pouches were perfect for me, and offer two servings per container. I measured out 1/2 of the bag, and made half a batch to start. 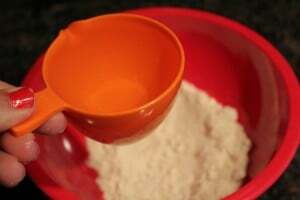 I loved the fact that you simply had to add water to prepare these beautiful pancakes. 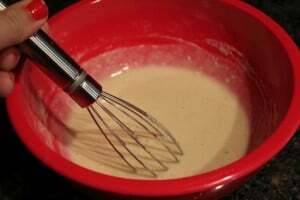 The package instructions recommended that you leave the batter sitting for a short period of time before you cook them, which was easy enough! 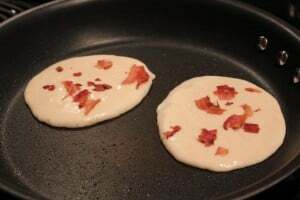 I had some leftover bacon in the fridge from my Cobb Salad creations, and decided to experiment a little with adding crispy bacon to my batter. Ashley apparently had the same idea, as she made the same pancakes with turkey bacon – – Great minds think alike! Note: I have seriously considered order that Perfect Pancake Pan… my pancakes are always funny shapes. 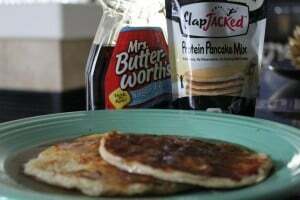 I topped these beautiful pancakes with 1/4 cup of Mrs. Butterworth’s Sugarfree Msple Syrup and dug in… While the texture was a little different than what I’m used to in fluffy buttermilk (translation: high calorie buttery pancakes), they were flavorful, filling, and delicious! I’m planning to make the second half of the pouch with a little PB2 mixed in, and I’m looking forward to trying the banana hazelnut. If it’s anything like the buttermilk, I think I’m in for a treat. 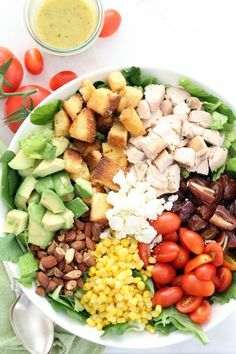 There’s also a listing of recipes you can make on the website that I’m eager to try too! 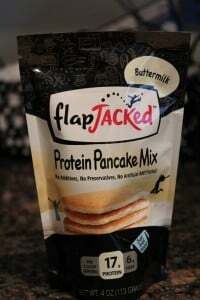 If you’re interested in trying these out, Flapjacked has a sample pack where you can order 4 oz. packages of all three flavors for $9.99 – – Buttermilk, Hazelnut Banana, and Apple Cinnamon. A great way to try all three flavors! Do you enjoy protein pancakes? Have you tried Flapjacked? Note: Flapjacked Protein Pancakes provided me with two free packets of their protein pancakes; however, all opinions above are my own. What's the 4th of July without Ice Cream?? ?